Our increasingly digital lives, full of social media, games, films, and other web products, are mostly designed and controlled by others. But what if we could wrest some of that control back, giving users sovereignty instead of granting it to businesses? 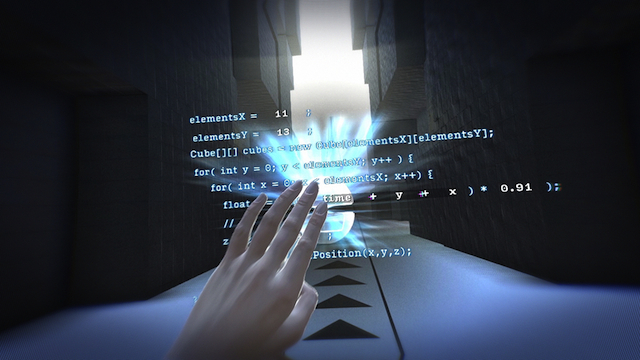 That’s the idea behind ‘Loop’, a game-like experience where users explore and alter virtual worlds with code. Created by German interaction and motion designer Stefan Wagner as part of his master studies at the University of Applied Sciences Würzburg, Germany, Loop is an attempt to override the mental programming created by media consumption. Using an Oculus Rift headset attached to a Leap Motion sensor and a mechanical treadmill, the Loop player walks through Wagner’s virtual worlds, where they are confronted with various scenes and surroundings that more or less reference real objects and scenery in the form of “system simulations.” By raising a hand and grabbing “code objects,” the user can interact with the virtual worlds, and in the process change the pieces of code upon which the simulations are built. Wagner created Loop on Unity 3D, using the Oculus Rift and Leap Motion SDKs skeletal tracking throughout the development process. 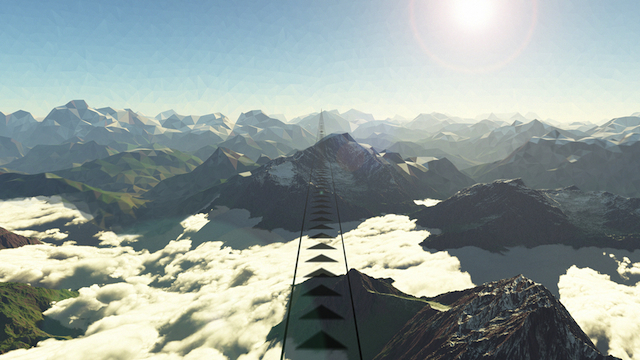 To generate the landscapes seen in the background, Wagner used Terragen by Planetside Software. The colored polygon figures, which contain the pieces of code, add a touch of arcade games’ point-rewarding system into the mix. The interface that presents the code is more technical-looking, with Wagner saying that it mostly refers to hologram interfaces from recent science fiction artworks. The style is designed to create the impression of a device connected to the world surrounding the player—”a futuristic machine allowing the user to change the structure of space and time,” Wagner says. Loop from Stefan Wagner on Vimeo. Click here to see more of Stefan Wagner’s work.